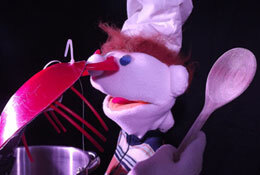 Original and traditional puppet shows, outrageous and engaging walkabout characters. For over three decades Living Daylights have been entrancing audiences of all ages in Wales, Britain, Europe and the Middle East. Carnivals, fetes, festivals, high streets, shopping centres, parties, weddings, celebrations, promotions, races, whatever the venue Living Daylights will add a spark to the event. "I was so involved in the show I forgot my baby."